LEAF Downtown celebrates communities, creativity, diversity, and families in the heart of downtown Asheville! LEAF Downtown will further the goals of inclusivity, community partnership and economic vitality in the greater Asheville area, while driving the greater LEAF Community Arts mission to connect cultures & create community through music & arts. 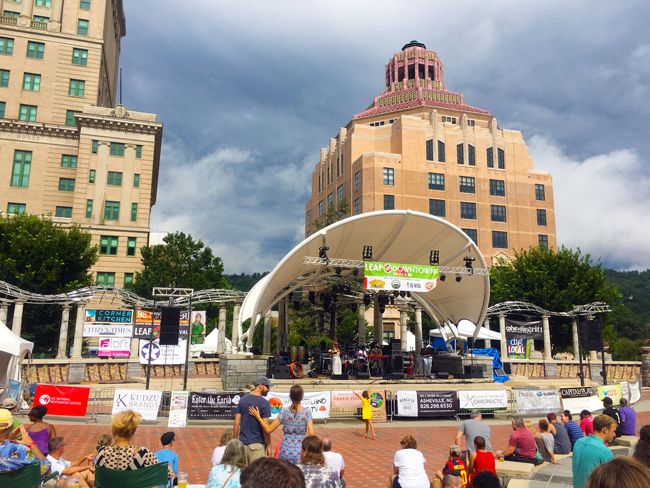 Get ready to Turn It Up at the 3rd Annual LEAF Downtown AVL, taking place August 4-5, 2017 in the heart of Downtown Asheville at Pack Square Park. LEAF Downtown AVL showcases dynamic musical talent, immersive cultural arts performances and local handcraft & culinary artists. Join the LEAF community to experience funk at its finest – pulsing through stages, conversations, connections and more! Visit theLEAF.org/downtown for more info on this inclusive, family-friendly, FREE event! Town and Mountain Realty is proud to sponsor the 3rd Annual LEAF Festival in downtown Asheville! Many of our agents have worked with and volunteered for LEAF for years and we are excited to get another opportunity to support our incredible community by participating in this event! Check out the video below with some clips from last year's downtown Asheville LEAF festival. Get inspired to come out and join in all the fun this weekend August 4th & 5th, 2017! "It was a pleasure to work with Leah and the Miller team! Leah is a very reliable and thoughtful person who put in a lot of efforts in guiding me through the process of finding the perfect home for m e. She was always super fast in answering and providing well-grounded information. I can highly recommend her." "Wonderful realtor and friend! Thank you Jody!" ~Jennifer W.
"We enjoy working with Cindy mostly because of her down to earth nature and no pressure attitude. Her extensive knowledge of the area and her passion for real estate shows through. Cindy responds quickly and follows through with answers for all of our real estate needs." ~ Ray and Patty M.
"When the going got tough Sean got tougher. Our road to find a house was long and complicated, but Sean stuck with us and made sure that we ended up with great home that fit our needs and budget. In fact our home exceeds our expectations. We will recommend Sean to anyone we know looking for a house. And if we ever decide to sell Sean will once again be our agent." "I am so glad that I got to work with Aviva Pitt during the purchase of my new house. She is professional and always made herself available to take phone calls, meet me at various listings, and get answers to the tough, home buying questions. Her understanding personality made the entire experience smooth and convenient. Her experience and dedication was instrumental to the close of my new home. The house buying process went so well that now I am having her sell my old house. I recommend seeking out Aviva Pitt for when you need a rock star realtor." "My wife and I have bought and sold 5 homes, all using different agents. Selling our home in Weaverville, Jessi and Luiz went above and beyond any agent we have ever used. Jessi, especially, was right beside us throughout the entire process. Even after a failed contract, we were able to find a new buyer within a week. We will surely recommend anyone we know to them that is trying to sell their home or relocate to the Asheville area." ~ Allen U. "Working with Cindy was amazing! She understood what we were looking for and got us the best price for our home! Cindy has become a huge part of our journey in pursuing our dreams of moving to the coast! Thank you Cindy, we are forever grateful!" ~ Allen and Catherine C.
"We are so thankful to have met Robin Cape and worked with her to find our home. She was a joy to work with, very knowledgeable, helped us find the perfect home for us, very communicative, and just an overall amazing person to work with. I feel like I do not have the words to describe how wonderful our experience was with Robin." ~ Kaitlin M.
"Working with Jody Whitehurst is a pleasurable experience. He is more knowledgeable than most realtors. He knows how to price a home in the correct fashion, as well as write a description that e ntices buyers. He sold my personal home, and I could not have been more pleased with the outcome. I would recommend Jody to anyone looking for a top notch realtor!" ~ Bradley R.
"Sean and Sophie made this as painless and easy as possible. Wouldn't use anyone else! Thank you two for everything!" ~ Justin S.
"Steve Heiselman was easy to work with, very professional, with an excellent knowledge of the Asheville and Buncombe County real estate market. He was also very accessible usually answering his phone and returning calls in a timely manner. He made it very clear from the first time we met that he wanted to earn our business and he was prepared to provide the highest level of service possible. Steve was a pleasure to work with and I do not hesitate to recommend him highly!" ~ Steve and Nan K.
"Moving back to the Southeast after living away for 5 years, we had a very specific feel we were going for when buying a home without knowing how Asheville had changed in the past few years. We were so lucky to find Ben, who guided us (literally!) through the neighborhoods, giving us history, culture, and his insight. We are so happy with our final decision, and we are so grateful for Town and Mountain's support!" "Jennifer Keleher is one of the best real estate agents with whom I've worked. I knew before the end of my first face-to-face meeting with her that she was the right agent for this sale, and I was right! Jennifer is professional and takes care of her clients. She supported me throughout every delay that came up during the final days to closing -- I think the closing date changed three times, and it was no fault of hers! I highly recommend Jennifer and Town and Mountain Realty for your Asheville area real estate needs. Thank you!!" ~ Debra L.
"We have known Ben (Mansell) for a long time; he sold us the house we live in 10 years ago. He is patient, professional and knowledgable. He works so well with all types of folks and situations, and has amazing industry knowledge."